It’s not a controller app. 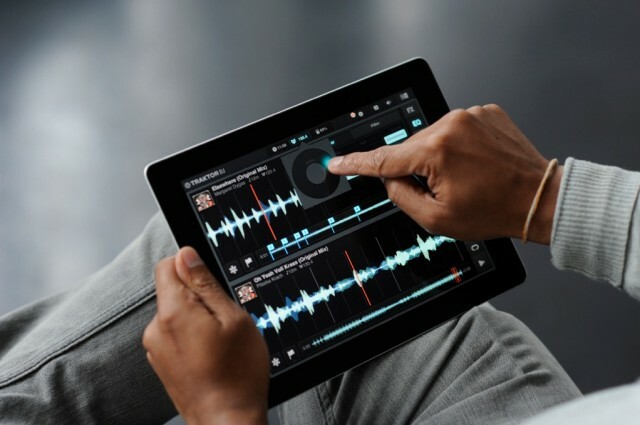 It’s not a “my first DJ app.” Native Instruments has released a full, two-deck version of Traktor, built from the ground up for the iPad, that nonetheless does essentially what the desktop app can. The same team behind the desktop Traktor has reconceived the library, effects, looping, sample navigation, and mixing around touch. CDM has been testing the result with the developers and in release candidate builds. 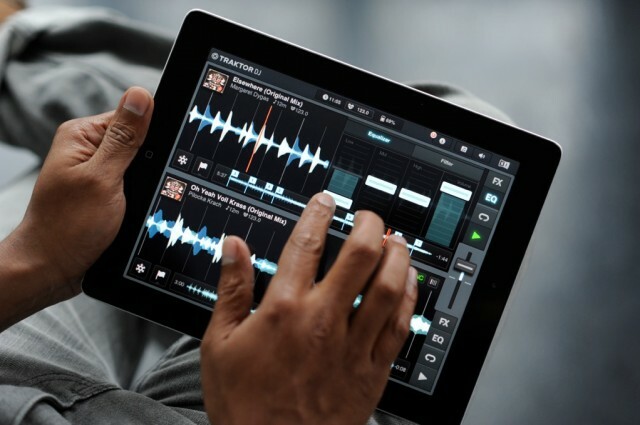 You can use Traktor DJ for iPad on a bus, or – if you’re Richie Hawtin or on vacation – on the beach. You can then turn around, sync what you’ve done to Traktor on your “desktop” Mac or PC – or skip the whole sync thing and just DJ with an iPad. What’s a bit surprising about all of this is that NI may have built a Traktor that appeals to a wider audience than the original. Having been instrumental in popularizing first digital vinyl, then digital control systems, NI could prove the company that takes the iPad into the club. Two-way sync with Traktor Pro – all your library files, cue points, and the like can go in both directions. So you can set some new sample loops on a plane, then go back to your laptop for a DJ set. Let’s talk about what all this feels like to use. Tap the ‘Freeze’ button, and you can trigger slices of a sound – matched to beat grid – for a sampler-style experience of a track. It’s a hell of a lot of fun, and something we’ll cover in more detail soon. Functionality like the EQ is cleverly mapped to touch. Touching sound, now for DJing. This may all sound a bit vanilla, but the actual experience of using these features via a touch point is radically different. Using gestures like pinch and swipe, you can more easily surf and scrub a waveform with your fingers. Setting cue points and looping, for instance, is as easy as gesturing directly on the waveform display. You can slice the waveform into parts and trigger bits of a sound – all locked to tempo grid if you so choose – and make beat grids in real-time. 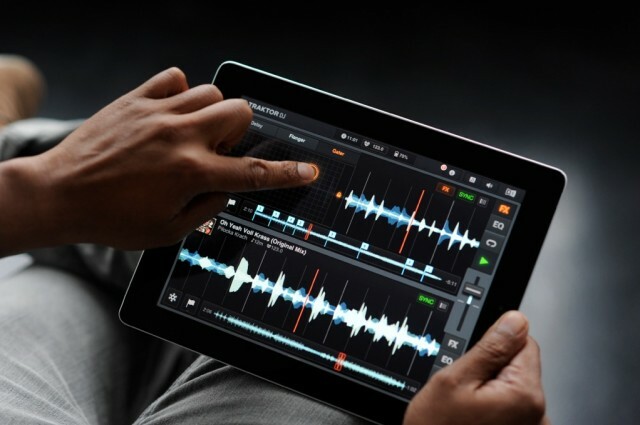 This could also be the end of the silly use of turntable metaphors on iPads – the plague that infects other iPad DJ apps. Instead of looking at a picture of a record, which makes it difficult to see what you’re doing, lacks the tactile feedback of a real turntable, and behaves in unexpected ways, you scrub around a waveform. In fact, the experience is so good I fully expect some music makers to pick up Traktor DJ and use it as a production tool, making it into a sample/loop app instead of a DJ app. 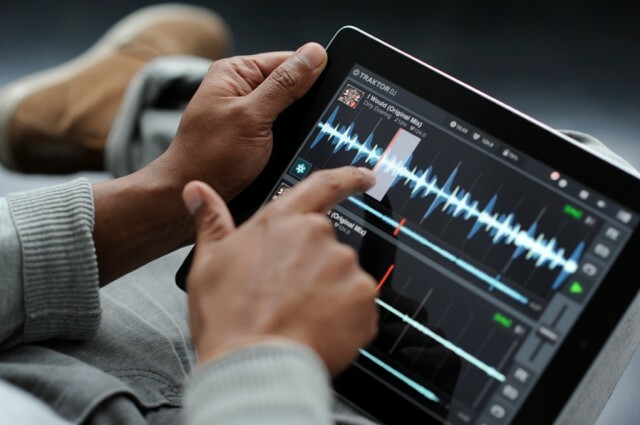 There are other apps dedicated to that purpose, but Traktor DJ has some neat tricks – and NI’s effects – that could make it an appealing instrument and sound design tool. 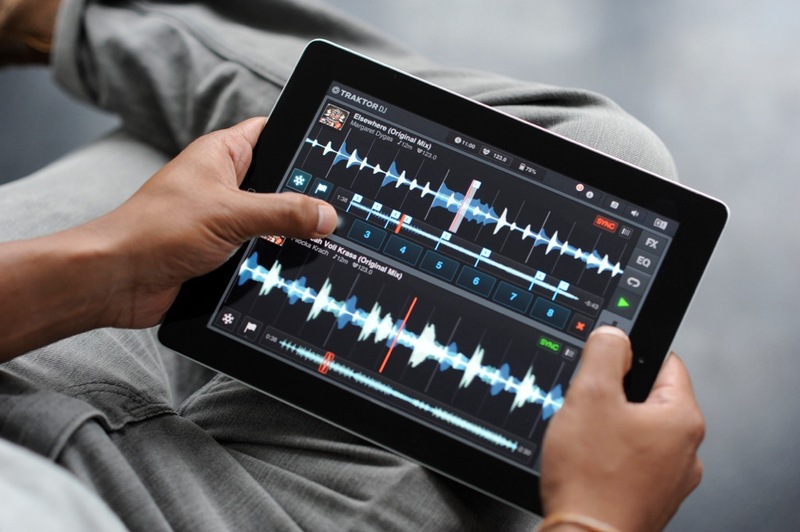 Make no mistake: Traktor DJ on iPad could help people make some really awful DJ sets. (It’s a shame we didn’t record the terrible sounds I made with it in my first play.) But with some practice, it could mean for DJs who don’t just want to mix tracks, the possibility of doing some clever looping and slicing in a new way that could be genuinely musical. Tempo changes get an interface control that recalls the old iPod scroll wheel. Ah, memories. Now, some of your likely questions answered. With Core Audio support, Traktor DJ does the better thing: it works with any class-compliant audio device, including the Traktor Audio 6 and Traktor Audio 10, via USB and the iPad Camera Connection Kit. That cuts down on portability a bit, sure, but it also makes this a real DJ solution when you’re actually playing in front of people. Sync works via Dropbox accounts. It uses only metadata, so even a free account will cover you. Beat grids, cue points, loops and BPM transfer between desktop and tablet. What isn’t there, apart from four decks (though that seems it’d be overkill on iPad)? You don’t get MIDI control, for one, which would have been nice, though the touch interface is lovely. And you can’t really customize the interface very much. So, I think there is a window for a different DJ app to rival Traktor with a distinct approach; this market isn’t over yet. You’ll need an iPad 2 or better; I think it’s safe to say the first-generation iPad is mostly a paperweight at this point, unfortunately, as far as developers are concerned. However, the iPad mini is a really beautiful device; I don’t own one, but tested one at NI, and it’s fantastic. Performance is slick, the interface is perfectly reasonable, and you can hold it in one hand. Available now. iOS 6 or later required. Yep, it’s Richie Hawtin time. Oh, it’s fine, Rich. You enjoy testing Traktor on the beach; I’m having a … great time … in this … Berlin … winter. Ahem. DE:BUG has a great review in German. Heh… watch for our images next week, probably not including me as a hand model.